B: You may receive an Invitation to join via email, in which case, click the link in the email to compete registration. Once registration is complete - you will be able to login with your registered email address and the Password you set during the registration process. If you forget your password just click the Forgot your password? Link on the login page/screen. 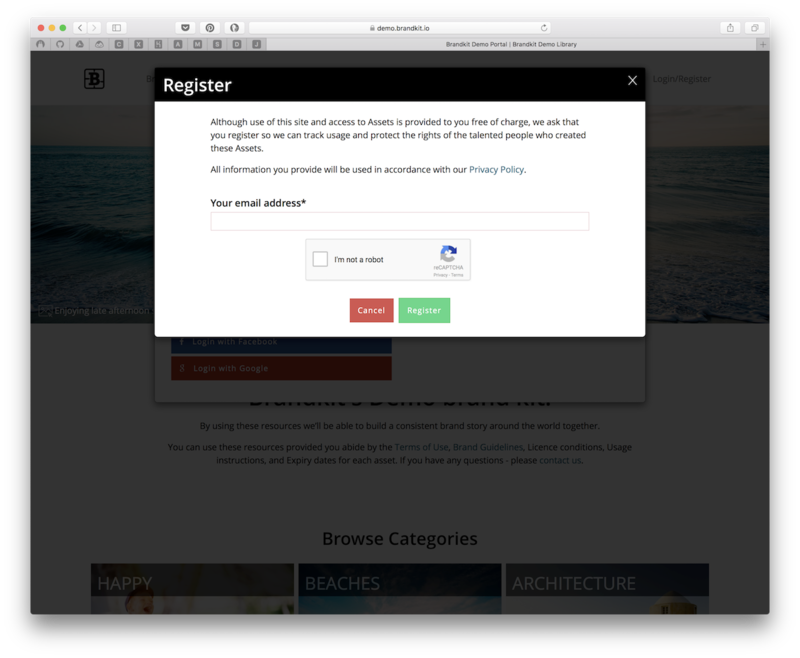 * Some brands allow you to look around before registration/login. You can start searching and browsing for Assets straight away. Start typing a search term in the search box (e.g. Beach) and we’ll display a list of suggested tags as you type. Select the tag you want by clicking on it in the dropdown (e.g. 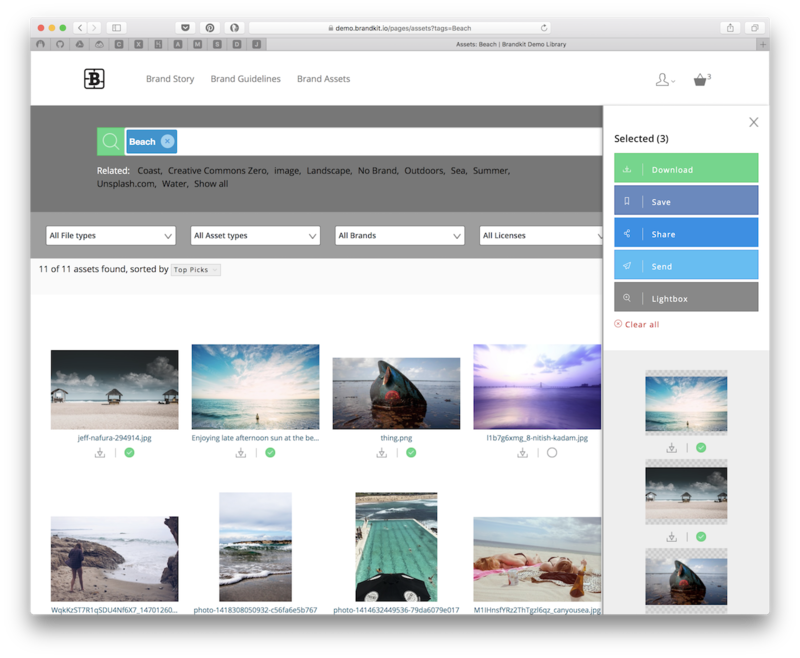 Image, and we’ll display a visual grid of assets (the Search Results). Brandkit makes extensive use of Tags (or Keywords) as the primary search method, entered by the Brand's Admin (and sometime via our AI image recognition bot). Tag Search is explained further in this blog article. 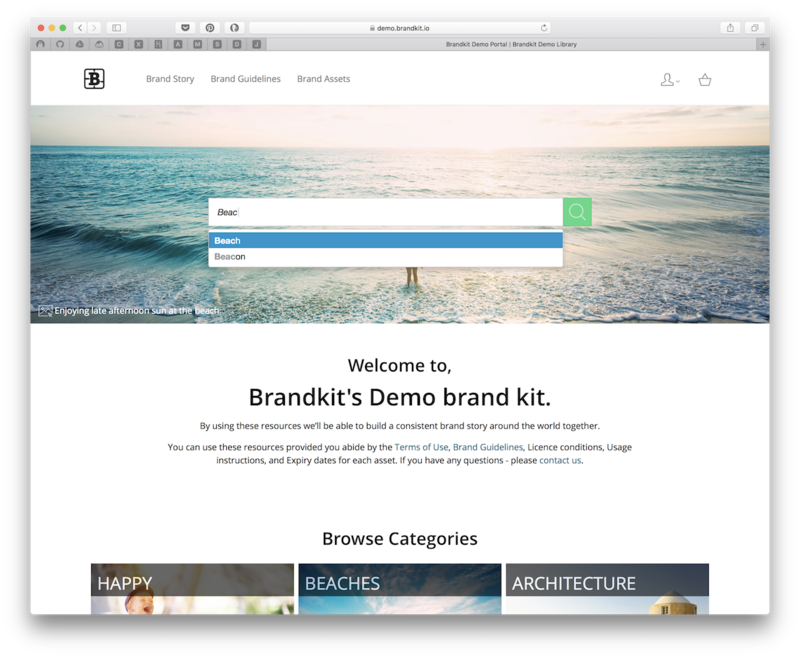 Some Brandkit customers also configure, menu items, tiles and other links on their landing pages that will enable you to jump to a pre-configured search result. You may also search for an Asset Type (e.g. Logo), a File Type (e.g. png) or Asset ID (if known), a Filename (if known) and an Alternative Reference (if known), Orientation (e.g. Portrait). You won’t get a typeahead auto-suggestion as you type (in these cases), but just keep typing and click enter to conduct the search. Select, Download, Save, Send or Share. 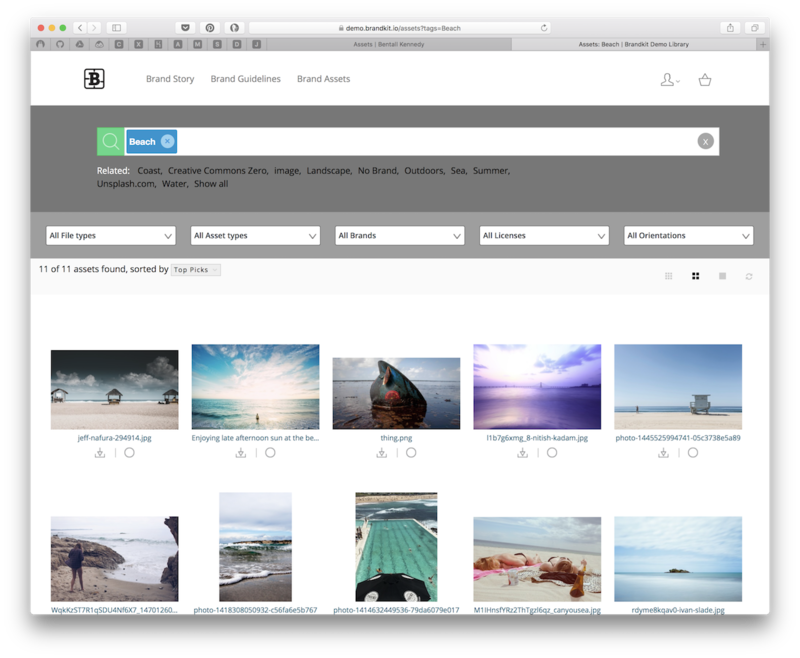 You will see Search Results in a visual grid. You can then scroll through and find any assets you want. Note that only 100 assets are shown initially on the results page, you can display more by clicking the Display More button at the bottom of the results page. You can further refine the Search Results by clicking a Related Tag shown below the search box or typing additional Tags in the search box. You can Download a single asset directly from this grid by clicking the Download icon (downward pointing arrow) below an Asset's thumbnail. Or you can Select one or more Assets by clicking the Select icon (circle) below each Asset you want. Select will add the Asset to your Basket (which will slide open on the right). Save the selected Assets as a Saved Basket for access later. Share your selection of Assets with someone via email. Send a Link to download your selection of Assets. View a larger thumbnail in a lightbox. It's typically free of charge to Access and Download assets. When you Download or Send files you may be asked you to answers a couple of intended use questions, that helps the brand track usage and understand how assets are being used. You can think of this as the "price"of access to the brand's files. This will help the brand understand usage, manage and improve content for you over time. Read provided Brand Guidelines. It’s an important document that covers the use of the brand assets. Please ensure you have read and understand it before using any provided Assets. 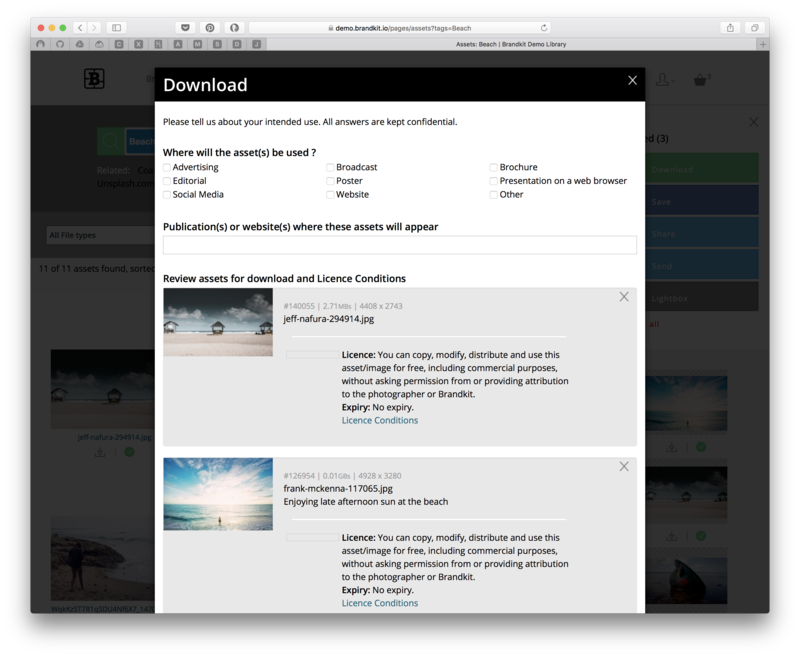 a. We’ll automatically attach our Brand Guidelines as part of the download (if configured to do so). You may remove the Guidelines (by clicking the “x” next to the Guidelines) to speed up your download but only IF you already have a copy of the Guidelines to hand. b. Alternatively you can download our Brand Guidelines from the Brand page (if configured). If you’re downloading a single image or a video you will be able to choose between downloading the Original high res version or a down-sampled web version. Note this option is only available if you have a single file selected for download. You may need to remove the Guidelines to reveal this option. Just close the browser tab or go to some other site. No need to log-out. We’ll record your activity which will be available on the My History page accessible from the User icon in the top nav. You can review this at any time and even re-download any assets you’ve downloaded in the last 7 days. You can always come back, your user account will persist forever, unless it's specifically suspended. Your user account is accessed by your email address. If you change your email - you can login and update your email at any time. You should contact Marketing from the Contact Us page (see site footer) if you have any questions about the content of the site or usage of Assets/Resources. 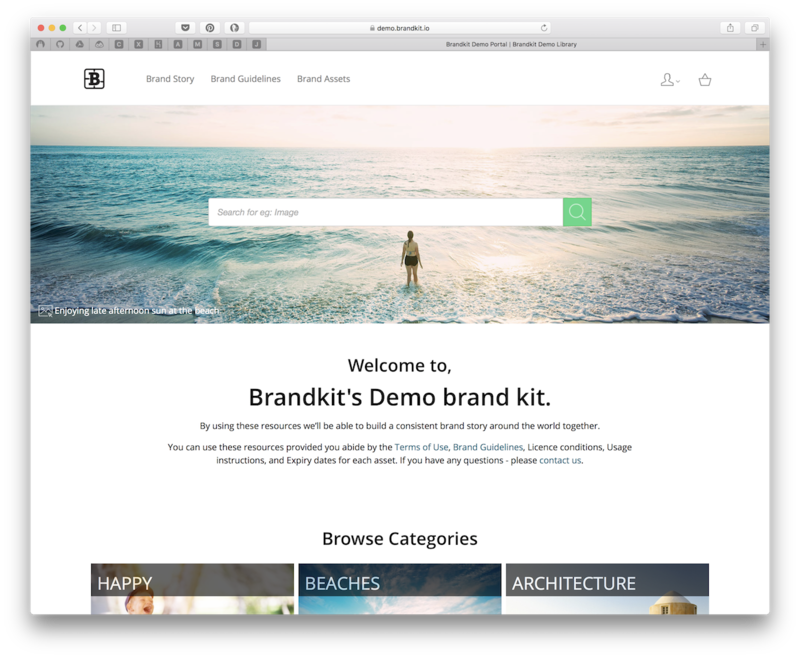 This website is powered by the Brandkit software platform. You can get technical help from Brandkit support by visiting the Help Center at http://help.brandkit.io.